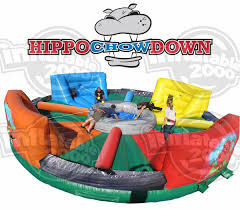 Get ready…get set… time to chow down you hungry hippos! This is one of our newest interactive game guaranteed to keep your guests laughing and playing for hours. In a 4-player bungee tug of war style game, the players must race to the ball pond in the center and retrieve as many balls as possible before returning them to a bag at the starting wall. Player with the most collected balls in the bag wins!